It is never an easy task choosing between two products when they both seem to be packed with amazing features and have similar qualities. It is not easy to decide which one scores better without comparing the items and carefully considering the various factors. This article is about Coleman Roadtrip Lxx vs Lxe. Two such products that often leave buyers in a state of a dilemma are the Road Trip LXX and the LXE, both made by the same brand-Coleman. Of course one would not be able to tell which one is better because it depends on the buyer’s preference and requirements so in our opinion it really comes down to what would work best for an individual user. But a decision has to be made and to make that easier for you we are going to be reviewing both of the grills today. By the end of this post, you should be able to point out the major differences and figure out which model is the best one for your needs. First up is the Coleman RoadTrip LXX Portable Propane Grill. This grill is perfectly designed for the road while being equally great for your backyard parties. With a foldable construction, the LXX can be popped and set up in a matter of seconds without any complicated assembling. The 285 square inch cooktop comes with 2 individual adjustable burners that deliver a combined power of 22,000 BTUs. Equipped with rugged wheels, once the grill is in its collapsed state, it can easily be dragged along to be set at any location. If you prefer to have a thermometer included in your portable grill machine then you will be glad to know that this model comes with a thermostat built in the lid. Sporting metal sliding side tables and 3 utensil hooks, the LXX shows off a steel design and a nice sturdy built. The Coleman RoadTrip LXE Portable Propane Gas Grill too comes with a wheeled stand and folds flat for easy transportation and storage. As a portable gas grill, it comes with all the essential features and functions that make it an excellent apparatus for outdoor trips and events. The cooking surface measures 285 square inches, which is the same as the LXX model and it also comes with 2 separate adjustable burners. The power delivered, however, is slightly less than its counterpart with 20,000 BTUs. You can switch between grates and griddles if preferred as the machine comes with 2 SwapTop grilling halves. Easy to assemble and start off, the LXE is a well-made grill that is simple to operate, maintain and travel with. At first, we want to breakdown or write a short story about Coleman Roadtrip Lxx grill review. The LXX offers 11,000 BTU per burner so you get a total of 22,000 BTU on this grill. Although it is only 2000 extra BTU than the LXE, many customers have mentioned that the grill felt much more powerful and seemed to get really hot- allowing them to cook up recipes that require high temperature. If you are never sure whether your grill is hot enough or ready to start cooking on then the built-in thermostat will come in handy for you. Located on the lid, the thermometer is one of the things that set the LXX apart from the LXE. It may not be an absolute essential because the addition or the lack of a thermostat really doesn’t affect the cooking quality of either the grills but it is still a nice feature to have on this one. With a cooking surface of 285 square inches, you get plenty of areas to prepare multiple dishes for your loved ones. The stainless steel burners are adjustable so you can use and control them individually or together, depending on your cooking requirements. With interchangeable grills, you have the option of using the included grates or switching to griddles (sold separately) to add variety to your cooking. To help you keep things organized and everything within hand’s reach there are 3 handy hooks included in the construction which can be used to hang your utensils on. 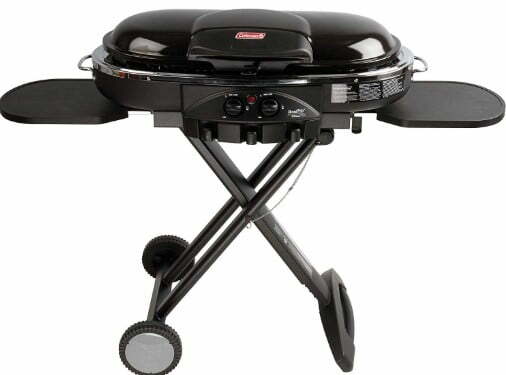 The ideal party size is 3 to 4 persons with this grill with a runtime of approx 4-5 hours on low setting. Starting the grill is easy with the InstaStart matchless technology. There are no risks involved and you don’t really need to remember to pack in a box of matches or carry a lighter for the purpose. The burners light up instantly first time every time so no time is wasted here. Side tables are a must on a portable grill because you will need that extra space to keep things like sauce bottles, trays, and other ingredients. The LXX comes with 2 metal side tables that slide to position and provide users with extra space that can be used for various reasons. It also eliminates the need for carrying extra tables during an outdoor trip. The cast iron grates can be removed and cleaned separately while a drip tray collects all the juices from the meats during the cooking process. To prevent food from getting stuck, the grates come with a porcelain coating that gives them a non-stick effect. However, some users did mention that it is not the easiest grill to clean when it comes to keeping the area beneath the cooking surface clean. We recommend not letting any dirt or grease build up inside the grill to make maintenance easy. The LXX is very easy to carry around, thanks to its collapsible construction and rugged wheels. When folded, the grill transforms into a compact unit that one can easily push or pull around without any strain. 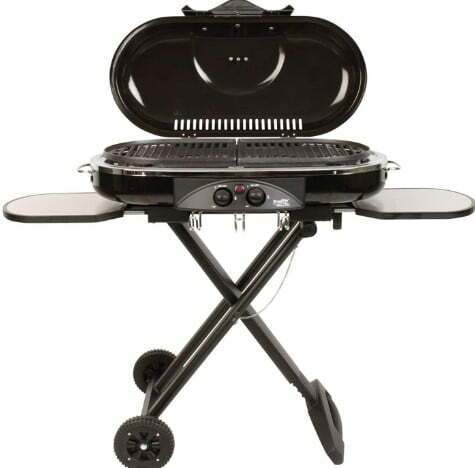 However, it is not the lightest grill machine with a weight of approx 45 pounds despite the compact dimensions and may be challenging for one person to pick up alone. But if you have a friend to help you carry it to and out of the trunk of your car then you are good to go. 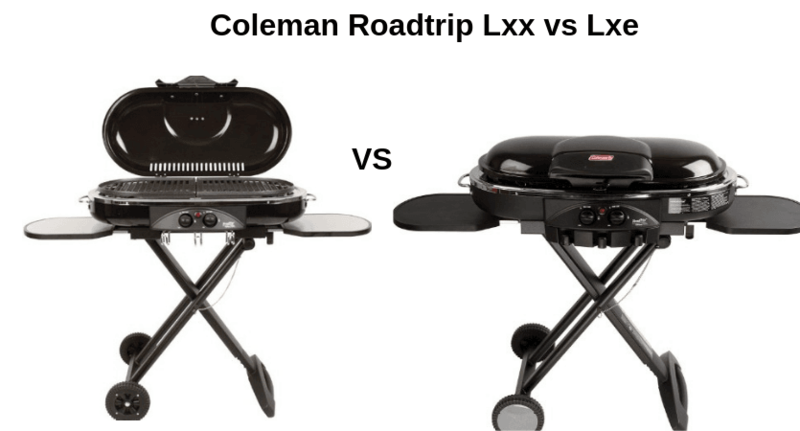 Now we are writing about Coleman Roadtrip lxx grill review to informed the different between these two. The LXE is slightly smaller in size when compared to the LXX with a lesser height and a low profile design. With a height of 35 inches and a width of 32 inches, the unit comes with a cooking surface of 285 square inches which provides a lot of space to cook various items of your choice. The weight of 44 lbs is not much different from its counterpart which means that you will probably need the help of another person to comfortably lift the unit up and place it in your car or at the back of your van while traveling. The LXE comes pretty much assembled so there is not much you need to do to have it ready for use. As it includes the use of wheels you will just have to attach them in place and also slide in the handle for your convenience. The whole unit is collapsible, allowing users to fold or extend as required. With a low profile lid, the height is minimized so you can easily shove it in the trunk of your car or even store it in a tight space when not in use. We don’t think the LXE or the LXX are lightweight models but the weight is really due to the heavy duty and durable parts and materials used in the construction of the grills. The wheels, however, make both the models very easy to roll around camping sites once you have them on the ground. There are 2 adjustable burners with that produce 10,000 BTUs each. You can control them separately and turn the heat up or low as preferred. If required, the LXE can also hook up to a larger propane tank for which you will need a separate high-pressure propane hose and adapter. The unit is geared-up to cook for up to 4 persons but many users have mentioned that the unit works great for an addition of 2 extra guests too. Not only is the grill easy to assemble, but it is also very easy to use and cook with. The unit comes with 2 SwapTop grilling halves just like the LXX which can be changed with a griddle depending on what you are cooking. We recommend purchasing a griddle so you can easily make pancakes or cook eggs for breakfast. As the grates are designed in halves, you can also use the large cooking area to grill sausages or steaks on one side and place a griddle on the other side to prepare other items of your choice. This mix and match feature seems to be quite liked by most users of this grill and we totally get what the rave is all about. To start the gas running you will only need to turn the knob to set the temperature and press the ignition button to get the unit powered up for cooking. You have to keep in mind that the grill is mostly steel so there is a risk of rust forming if all the areas are not cleaned well after every use. The grates are all removable so cleaning access is good and there is also a drip tray that collects all the grease so if you can maintain a clean-up routine then you should not have a problem keeping the grill in a good condition. The Coleman Road Trip LXE is packed with many small details that all add up to make it an amazing grill for the outdoors. Features like sliding side tables, easy to attach components, 3 hooks to hang utensils and interchangeable grilling halves are some of the things that make up the construction of this portable grill. The low profile design may be a concern when cooking large items that require the lid to be closed which is something that limits the use of this grill but other than that it is one of the best choices for people who need a grill for camping and traveling with. Both the LXX and the LXE are valued added products that do justice to the asking price but if you are wondering which one costs a bit more then the answer is the LXX. The LXX comes with a thermostat and is slightly more powerful than the LXE but we are not sure if that is enough to explain the price difference. The models are similar in many ways so if we ignore the minor differences we really cannot pick one over the other. Here is the short video about Coleman Roadtrip Lxx vs Lxe. So now you can pick up any of them according to your desire. In this article, we try to write Coleman road trip Lxx grill review and In the same way to Lxe. Though it is difficult to choose the best one we have to choose one of them. According to our editors, Coleman Roadtrip Lxx is a good option for you. You may also read about Weber q2200 gas grill. Anyways hope we will meet again in another article. Till then bye bye.